Sneeweis’ first game is hereby officially announced as it enters the beta testing phase! Oggipital, with its cute characters the Kisau Veelas and the Oggiput is a puzzle game about quick decisions and accurate finger moves, about the pursuit of the highest score among your friends. Perfect for those minutes on the sofa when home alone. On the back seat on a road trip. Between the bus stops. In the loo. Quick to play, quick to annoy, quick to thrill. 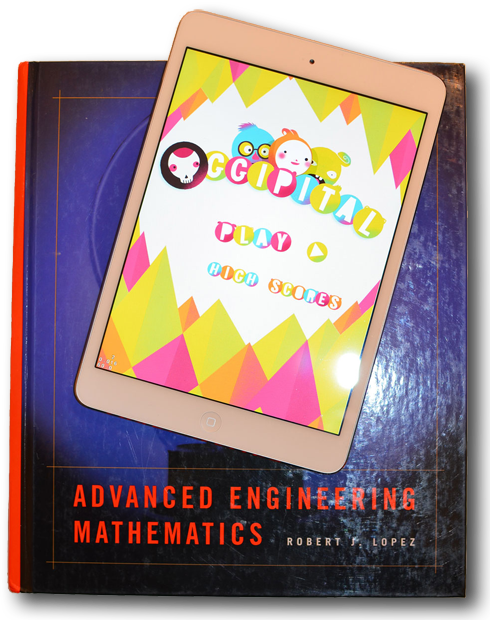 It probably won’t help you to become a better Oggipital player by reading the book. The book is recommended reading, nonetheless. Look! It is already playable on an iPad if you’re one of the lucky beta testers. But it’s not yet released, you’ll have to wait to around April 2014 to find it in the App Store for your iPhone, iPad, and iPod. An exact release date will be decided while we go along in this blog. For a more formal game presentation please visit the Games Page. If you like to stay updated through Facebook, please “Like” Oggipital’s Facebook page here. For more granular, and not always game related droplets of awesomeness, follow our Twitter feed.